As millions of people watched the 2019 Tournament of Roses Parade Tuesday, all eyes were on a float featuring a Kansas City woman. Leah Brown was honored during the parade for her life-saving tissue donations. Brown was caught in the crossfire and killed during a shooting in downtown Lawrence in 2017. Since her death, she has helped save or enhance the lives of about 75 people. KANSAS CITY, Mo. — As millions of people watched the 2019 Tournament of Roses Parade Tuesday, all eyes were on a float featuring a Kansas City woman. 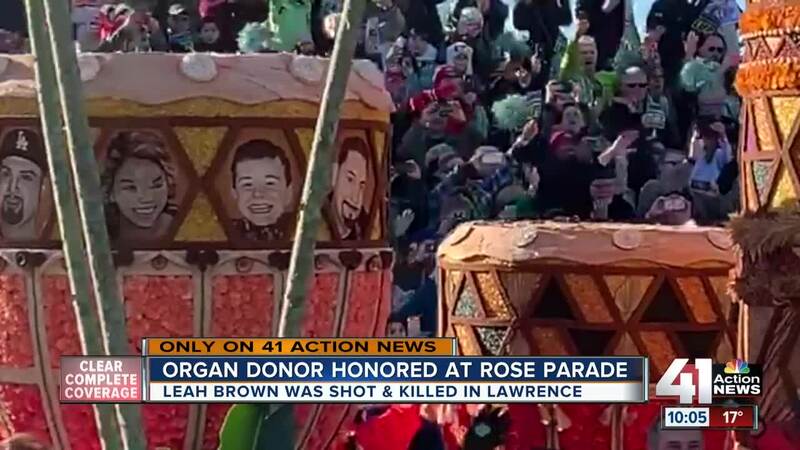 Leah Brown was honored during the parade for her life-saving tissue donations. Her picture, a floragraph made of floral and other natural materials, was featured on the Donate Life Float as a way to honor her life and donation. The float incorporated 44 floral portraits honoring deceased donors, including Brown. Twenty-six living donors or transplant recipients rode or walked beside the float. "It gives these families a reason to celebrate in the midst of tragedy," said Michala Stoker, the manager of public affairs for the Midwest Transplant Network. Brown was caught in the crossfire and killed during a shooting in downtown Lawrence in 2017 . Since her death, she has helped save or enhance the lives of about 75 people. Brown's family continues to celebrate her. Before the parade, they placed roses on a float that carried her picture. Her family and best friend sat with other donor families during the parade, sharing stories and remembering Brown. They said they hope the float will inspire others to give the gift of life and register to become an organ donor. "Her legacy continues. Even in her death she is continuing to make an impact on people's lives everyday," said Stoker.